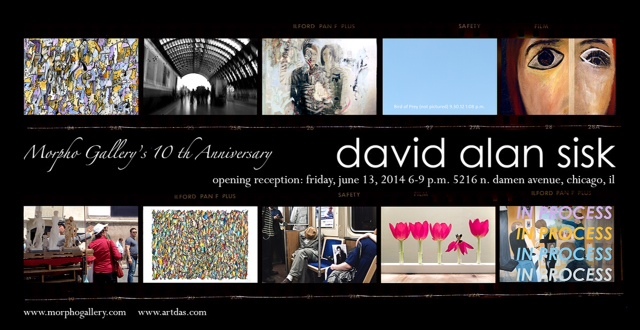 David Alan Sisk was one of four artists featured in the grand opening of Morpho Gallery ten years ago. Over the past decade, he has continued to exhibit regularly at Morpho. In honor of our 10th anniversary, we will be exhibiting a retrospective of selected works by David Alan Sisk along with his current work. David Alan Sisk is a visual artist in Chicago. He is also a psychotherapist and scholar in psychodynamically oriented clinical social work. David utilizes art as a means of exploring ideas, relationships, and the nuances of human experience. In this current exhibition, he will be exhibiting selected photographs, paintings and conceptual works created over the past ten years that portray the development and breadth of his work. This entry was posted in Openings and Events and tagged David Alan Sisk, Morpho Gallery. Bookmark the permalink. David Sisk is a multi-talented Chicago artist and what better way to celebrate Morpho’s ten years of supporting local artists then with a Sisk show!!! Congrats Morpho!